I am heading out with the dogs to the UKC Premier next week. Because my Jeep no longer has functioning air conditioning, and I am camping the entire weekend, I wanted a way to keep the dogs cool. One of the things I HAD to have was a battery-operated or solar-powered option. I’m not sure if I’ll have access to electricity, so an AC-powered box fan inside the tent and/or near their crates just isn’t going to work. I went to 5 different stores attempting to find crate fans to no avail. I could order some from an online retailer (to the tune of $30 each) but I’m worried they won’t get here before I get on the road. What I did find was a small (6″/12 cm) battery-operated desk fan for $6. 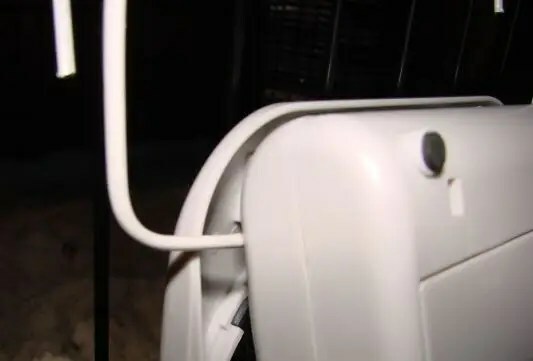 The battery compartment hinges, and the fan has two speeds–hi and lo. It runs on 2 D-cell batteries (not included) and has an option for DC input with an adapter that did not come with the fan. (Side note: there was a LARGE fan sold next to these that was also battery operated and came with an AC adapter. It requires 8 D-cell batteries, so I didn’t buy that fan). When I got home I found a wire hanger (though any thick wire will do, as would strong string), my pliers, and diagonal cutters. 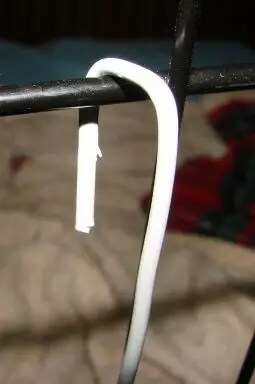 I cut the hook off the hanger, straightened it out as best I could, and bent one end to make a hook that would hang on a crate wire. 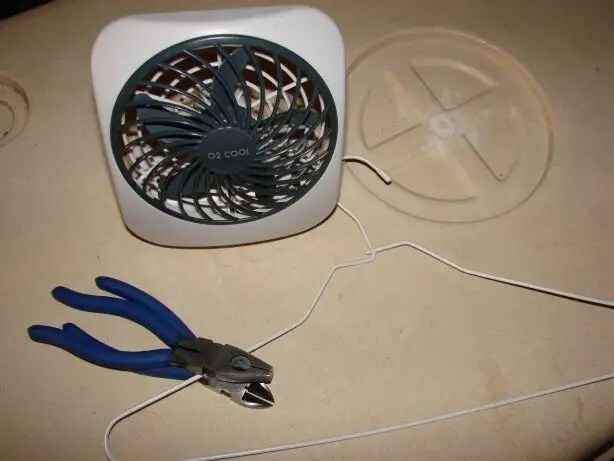 I then bent the wire to fit under the battery compartment, bent another hook to attach the fan to the crate, and cut off the excess length of wire. I want to get a solar-powered battery charger so when I go on the road I never have to worry about having batteries for the fans. I hung the fan low enough that it would blow on the dogs while they were lying down. 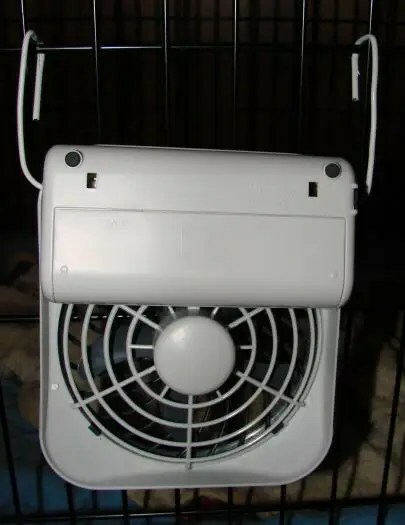 With this setup I can still access the power switch, and I can easily move the fan around the outside of the fan as needed.